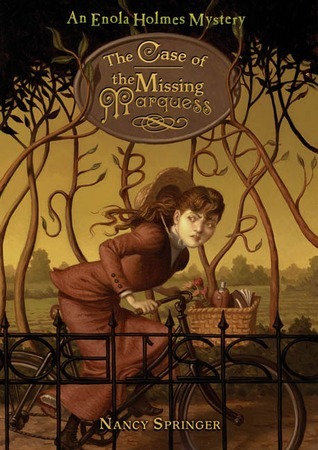 The Case of the Missing Marquess (Enola Holmes #1) by Nancy Springer. Grades 4-8. Philomel, 2006. 214 pages. Review copy provided by my local library. Enola Holmes has never been sure why her mother named her Enola. After all, it spells "Alone" backwards. But when Enola's mother mysteriously disappears on the day of her fourteenth birthday, Enola suddenly is alone. She calls on the help of her older brothers, Mycroft and Sherlock Holmes, but it soon becomes apparent that Enola's going to have to track down her mother herself. Luckily, her cipher-crazy mum gave Enola a book of codes as a birthday present and these prove very useful. It's not easy getting along as a young woman in a man's world, but Enola's determined and she soon finds herself swept up in an entirely different mystery on the dirty streets of London. Enola Holmes is a quite capable, intelligent young lady and I never doubted for a second that she had the smarts and gumption to solve the mysteries she stumbled into. My problem with poorly written children's mysteries is that I want to shake the kids and tell them to go tell an adult. With Enola's father deceased, her mother run away, and her brothers determined to stick her in finishing school, I had no problem with Enola running off to do things her own way. The language and strong setting also appealed to me. Enola's along-the-way commentary about the difficulties of being an independent woman added to the sense of time and left no question as to her indomitable nature. Details of life in late 19th century England and London are woven seamlessly into Enola's story, from the newfangled bicycle she rides to the constricting dress her brothers insist on. For kids who dig the codes Enola has to break to crack the case, I'd recommend The Puzzling World of Winston Breen. For tweens and teens who dig the setting and time period, I'd recommend the Jacky Faber books starting with Bloody Jack by L. A. Meyer or Gail Carriger's new Finishing School series, starting with Etiquette & Espionage. I read this book for my staff genre reading project. We're Reading Wildly (and widely) in 2013 (and beyond! ).